I am at this moment cruising at FL 360 over Michigan in one of GoJet's sparkling brand new CRJ-700 ships serving as United Express 7405 from Syracuse into ORD. As we slip through the sky free of any of those nasty surly bonds, I marvel as I look down to see that each little 'berg along our route has a long sliver of tarmac or concrete at the edge of town with tiny specks of white dotting a large ramp area. The "tiny specks" are someone's Cessna, or Piper, or Cirrus, and they are parked in front of possibly a small shack serving as the bathroom/flight school/airplane gas stations we commonly refer to as FBOs. As we plow westbound pushing air molecules out of the way, the crew up on the RJ's flight deck shares a common bond with the pilots, CFIs and flight students that inhabit those many little fields exactly 6.8 miles below seat 10D. They are part of the tight-knit community of GA souls that have earned or are earning the privilege to be able to legally fly in this country. If we were able to touch this Bombardier down at any of the little airports slipping behind my RJ's wing, we'd be able to hear a harrowing tale of many threats that stand in the way of GA's continued free and happy existence. User fees, fuel restrictions, rising costs of training and aircraft acquisition, an economy left as rubble by eight years of cowboy politics – the list of threats to GA is long, and there are many resources on the 'Net to learn more. 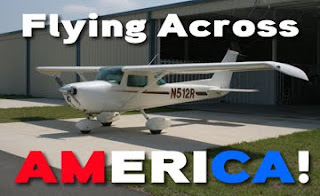 Among them are GA Serves America, an AOPA site that is a must read. As aviators, it is critical that we all stand together to inform the public about the benefits of GA, while also helping the media to dispense accurate information that GA does not pose a security risk to America. We need to find one voice to make Average Joe and Jane understand that "business aviation" comes in many shapes and sizes, from the Super Cub hauling mail into the Idaho back country, to people like me flying Cherokees to visit clients, to firefighting aircraft trying to save Los Angeles from its firestorm du jour. And yes, GA is also the rich and famous flying G-Vs and Falcons to lunch on Bora Bora, but can you blame them, really? If you had their money, you KNOW you'd fly in that sort of private luxury. When it comes to informing the public about GA, many of us talk the talk, but we never DO anything. 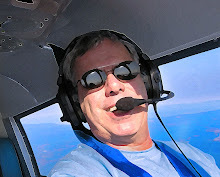 There is, however, a pair of GA pilots out there who are organizing a huge flight across America in a STOL Cessna 150, to raise awareness about GA issues in a whole bunch of places along their route. On 6.10.10, Jason Schappert, a 1,500 hour Certified Flight Instructor from Florida and Vincent Lambercy, a Swiss private pilot now living near Frankfurt (Germany), will depart Daytona Beach, FL and head out on a massive and expensive 4,000 NM mission, one that every pilot in this country should try and support. Schappert and Lambercy chose the Cessna 150 because they believe the Cessna 150 embodies general aviation. As they roll up to the TV cameras in these little and big towns in the 150, they will be trying to show the media and public that GA is not for just "the elite crowd", that it is something anyone can do regardless of income and that it's a wonderful family activity. After a couple of weeks of pilots making personal visits to TV newsrooms and the local paper inviting the media to the patch out at the edge of town, the camera crews and news reporters gather just before arrival time. The local TV anchor and anchorette have teased the event for a few days, and a couple of hundred people gather as well, joined by the Mayor and if they are lucky, maybe even a Congressman. The "Flying Across America" Cessna 150 lands and taxis up to the crowd and after shut down, two tired but happy GA pilots emerge from the cramped craft, smiling ear to ear. They spend the next hour "on camera" talking up how cool it is to be a licensed pilot, and how much GA benefits the entire country at many levels. They tell the media that the LifeFlight chopper that saved someone's bacon after that nasty head-on over by the Dairy Queen, yup...that was GA. The FedEx Caravan that brought your overnight package...you guessed it, GA again. They tell them everything we need them to hear, and after the TV guys get some footage of a young child sitting in the 150 wearing Lambercy's headset and grinning wide, the media can go back and report that GA is alive and kicking in this city and across America too. After a fuel stop and maybe a $100 burger, the Cessna departs again for the next little town circled on the chart, to land again, shake a few paws and talk up GA to anyone who will listen. They will do this again and again, all across these United States, until they reach Catalina Island off California's coast. At that time, they will have told our story to thousands of people at the airport and many thousands more at home watching the evening news or reading the local fishwrap. These are the EXACT people who need to know how wonderful and vital GA is to America. If this sounds like a worthwhile effort, please help me and the blogging community to support Flying Across America any way you can. You can go to their web site and sponsor a few air miles, or contact the pilots to help coordinate a media event in your town if it's generally along their route of flight. But the REALLY cool thing one of you can do is bring to this effort serious corporate support, the kind of support that will allow these motivated pilots to take this mission to a much higher level. If you are a decision maker at any one of a large number of airframe makers, avionics suppliers or any other aviation-related corporation, I urge you to contact Jason or Vincent by clicking here today to offer as much financial support to Flying Across America as you can afford. Even if you are just a Hollywood star that uses GA to sneak into Aspen for a weekend of skiing, cut a check to this cause to say thanks for spreading the word. I will be watching this flight closely and reporting as much as possible via this digital soapbox I call World of Flying. The planned route is Ocala - Daytona Beach - Destin - Baton-Rouge - Houston - Sweetwater - El Paso - Prescott - Santa Catalina. On the way home they'll fly Santa Maria - Las Vegas - Sedona - Roswell - Austin - Lafayette - Pensacola - Daytona Beach - Ocala. And it is truly too bad they are not coming anywhere near Eugene, Oregon, because I'd love to round up the local media here in Duck Country, USA and let them find out why my life revolves 24/7/365 around this fantastic thing we call General Aviation.